UPDATE: Following the accommodation sale on 27 October 2018, the campervan and caravan fields are now Sold Out. A limited number of additional campervan tickets for the 2019 Festival will go on sale at noon on Saturday 10th November. Any cancellations will be offered in a resale in April 2019. Anyone planning to bring a campervan or caravan in 2019 will need to book their own campervan/caravan tickets and will need to present both their named campervan/caravan ticket and Festival ticket to be able to park in these fields. Campervan/caravan tickets will feature the name and address of the ticket booker. A maximum of one campervan/caravan ticket can be booked per transaction. If your campervan is larger than 8m in length, please book a large campervan pitch, which are only available at the Bath & West Showground. Caravans/campervans larger than 8m will be turned away from the East and West Campervan areas and will be sent to the Bath and West subject to space still being available and will be charged the extra. 2019 caravan/campervan bookings will be taken by the Festival’s nominated booking agency, See Tickets, from 10am on Saturday 27th October 2018. Suitable for Families, those with access issues and those looking for a quieter field. Situated between Blue route and the Festival site. Turn left for Quiet Camping off Blue route. Situated off Blue route turning right to access the camping fields. Located at the Bath & West Showground, with a 24 hour free shuttle bus service to the Festival site. Please note that demand for campervan tickets is usually very high, so we would recommend booking one as soon as they are released. As with your Festival tickets, campervan tickets are non-transferable and will include the name and address of the booker. Attempts to re-sell them may result in their cancellation. If you book a campervan ticket and later change your mind, refunds are available prior to the ticket refund deadline (3rd May 2019); subject to an administration charge of £10. Campervan tickets are only available to general admission ticket holders. It is not possible to purchase a car park or campervan ticket in conjunction with a coach package. Campervan tickets will be sent out with your Festival tickets (unless booked in a resale or after paying your ticket balance). 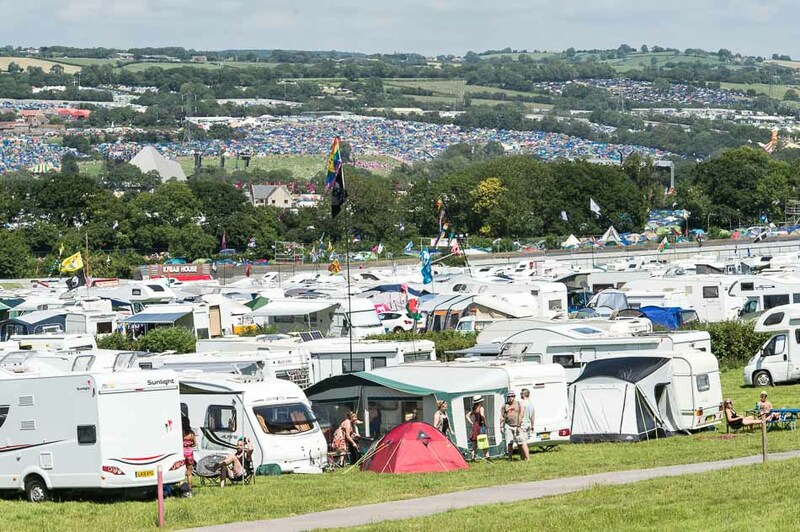 Caravans, trailer tents and campervans will only be admitted to designated campervan fields either along specified routes off the A37, on the A361 or at the Bath & West Showground (A371) according to the type of ticket purchased. East Campervan field access is via a one way system that is reversed for the Exit on Sunday 30th June at approximately 14:00. From this time on Sunday to around 21:00 on Monday 1st July, the exiting traffic means that no access to the East campervans can be allowed. Please do not leave East Campervans and expect to get back to the fields or arrange for pick- ups on Sunday 30th June or Monday 1st July unless you are happy to park in the car parks and wait to gain vehicle access after 21:00 on Monday evening. Please note that for hire caravans can only be delivered to the East Campervan fields by prior agreement with the Festival before the Festival opens. If a hire vehicle is over 8m it will be refused access. Hire vehicles over 8m can only be delivered to the Bath and West from when the access is open (there is no pre delivery). Make sure that you have the appropriate ticket for the vehicle that you are bringing or you will be refused access. Can I park my campervan/ caravan in the main car parks? Do I need a special ticket for the camper/caravan fields? Does every person staying in our campervan/caravan need a Festival ticket? How do our friends gain access to the campervan fields if they travel separately? What counts as ‘suitable fitted facilities’ in a camper/Caravan? What will happen to my vehicle if it is considered unsuitable for the campervan fields? What facilities are provided in the camper/caravan fields? Does the Festival provide campers or caravans for hire on site? Can I hire a camper/caravan myself and bring it to the Festival? Can the Festival supply details of camper/caravan hire companies we can use? How do we gain access to the camper/caravan fields on arrival? When can we gain access to the camper/caravan fields? Can our group of friends have pitches next to each other as a group? How far is it from the campervan site to the Festival? I have difficulty walking a long distance – can I be placed nearer the field entrance? How do I arrange for my hired camper/caravan to get on and off site? Can my car be kept beside the caravan in the camper/caravan field? If I am travelling in a separate vehicle to the caravan/campervan can I park in the campervan fields? Can I pitch a tent next to my camper/caravan? Can I bring my trailer tent? Can I bring a winnebago or extra large caravan? Will I be able to put up an awning? Can I sleep under it? How will I know where to place my campervan/caravan/towing car/awning/tent in the field? Can I bring glass bottles with me in my camper/caravan? No. Sleeping in vehicles in the car parks is strictly forbidden, as it is contrary to our licence. Regular checks will be made by Security patrols. Separate fields for ticket holders to park campervans and caravans are available. Do I need a special ticket for the campervan/caravan fields? Yes. Campervan/caravan tickets to park in these fields are available for an additional fee of £120 for a single pitch (all Campervan sites) or £200 for a large pitch (at Bath and West only). Please note that there are 5 options of campervan ticket available – General or Quiet/Hire (Single) pitches on Blue Route on the East of the site; General (Single) pitches on Orange Route on the West of the site, and General (Single and Large pitches) at the Bath and West Showground (White Route). See the table above for details. Please ensure you follow the correct route according to the colour of your ticket. Yes. No one will be allowed into the Campervan/Caravan fields without a weekend Festival ticket. If your friends are arriving separately to your campervan or caravan they will not be able to gain vehicular access to the campervan fields (as only one car is permitted on the pitch). They will need to buy a car park ticket to park in the public car parks, or travel by public transport, and make their way to the campervan fields on foot via the pedestrian gates. If they are travelling to the East side they can walk directly from the car park into the campervan area. On the West side they will need to park in the car parks, then enter the site through the pedestrian gates and walk through the site to the West Campervan pedestrian gate. For the Bath and West Showground follow White Route, or catch a free shuttle bus from the Festival Bus Station. Your campervan/caravan MUST have purpose-built fitted sleeping facilities and either fitted cooking or washing facilities. Any converted vehicles must clearly be live-in vehicles. This does not mean simply a van with a piece of foam cut to size for a bed, and a bucket for washing! A team of campsite staff and security staff will check that campervans and caravans coming into these fields have bona fide living accommodation. No other vehicles will be let onto these fields under any circumstances – not even late replacement vehicles in the case of a breakdown – sorry. Unsuitable vehicles, including unconverted vans, with tickets for the camper van fields, will not be allowed entry and will be sent to one of the festival car parks – and, as it is contrary to our licence, security patrols will not permit sleeping in any vehicles in these car parks. What facilities are provided in the campervan/caravan fields? Water, waste-water containers, toilets, and a food trader open 24 hours a day. The fields are surrounded by fencing and patrolled by security staff. There is no electricity provided for field users. The Festival does not rent caravans to ticket holders, or have any arrangements with contractors to rent caravans. Can I hire a campervan/caravan myself and bring it to the Festival? Yes, provided you have purchased a weekend Festival ticket and a campervan ticket. Can the Festival supply details of campervan/caravan hire companies we can use? The Festival holds no such details, and is unable to provide any information regarding hire. Please make your own enquiries. If hiring campervans or caravans it is your responsibility to check out the company and make sure that they are a legitimate company providing safe vehicles to the relevant standards for the hire industry. Glastonbury are not responsible for any hire company failing to fulfil their contractual obligations. How do we gain access to the campervan/caravan fields on arrival? For the West (orange) approach from the West (Glastonbury) on the A39 and A361 and follow the orange campervan signs. For the East (Blue) for both Quiet and General Campervans approach the festival using the A37 from the North or South and the A361 from the east and follow the Blue Campervan signs. For the White Campervan Site which is situated on the A371 approach from the A37 and turn onto the A371 by following the white campervan signs. A campervan/caravan ticket with your specific routing colour will be sent to you with your Festival tickets, which will permit access to the Pylle Road via the Blue Route, the Orange Route from the A361 or the White Route from the A371 and allow you to park in the appropriate campervan/caravan fields. You will need to display the coloured routing element in your window on approaching the site. You will then be issued with your pass on site once your campervan/caravan has been checked and approved by the campervan/caravan field stewards. When can we gain vehicular access to the camper/caravan fields? First entry is from 12:00 hours Tuesday 25th June until 1400 hours Sunday 30th June. There will be NO access to the campervan fields prior to noon, Tuesday 25th June. Please be considerate of local residents and businesses. In order to keep the roads clear, there will be no queueing facility prior to gates opening. Any vehicles arriving before noon will be turned away. Please be aware that the Police will have officers patrolling and you may get a ticket for obstruction of the highway if you block any of the main roads locally to the site be considerate and stay away from the area until the gates are about to open. To enable traffic to exit the site, Blue Route becomes one-way outbound from 1400 hours Sunday afternoon until 2100 hours on Monday evening to enable all the campervans/caravans and site traffic to exit. As a result, no vehicles can access the campervan/caravan fields during this time. Please do not leave the campervan/caravan fields in your vehicle and expect to get back to the fields during these times, or arrange for others to pick up during this period, as access will be refused. Return entry (for collections) is from 21:00 hours Monday 1st July 2019. Can our group of friends have pitches next to each other as a group. Sorry, we can’t hold pitches so if you want to park next to each other you will need to arrive together (and have booked in the same campervan section). We’d estimate it is approximately a 10 minute walk from the East and West campervan fields to the outer areas of the Festival, and 20 minutes to the main stages, at an average pace (longer when the site is busy). However timing will depend on where in the fields you are placed as some fields are much further out than others. The site map will give you a general idea of the distances involved and your nearest access points. A free shuttle bus is available 24 hours from the Bath and West Showground to the Festival Bus Station. Due to the location and distance to the campervan fields we recommend that anyone with a mobility issue should contact the Accessibility Team to discuss what options and facilities are available to them. Please note the disabled access facilities are for festival goers with permanent disabilities, so broken legs, recent injuries or pregnant woman do not qualify. How do I arrange for my hired campervan/caravan to get on and off site? We have developed a system with the contractors delivering the campervans/caravans so they can use the hire document/delivery note to bring the vehicle on to the Festival site. The contractor will need to arrange access to the fields by contacting the Off-Site Manager through the Festival Site Office. The ticket holder then uses the campervan/caravan permit to get into the site when they arrive later. After the Festival, it is not possible to gain access to the site to pick up a caravan between 14:00 hours on Sunday afternoon and 21:00 hours on Monday evening. Campervan fields’ staff leave on Monday when the there are no queues for the exit. After this time caravans can be left until Tuesday midday for a contractor to pick up. All caravans whether delivered prior to the campervan area opening, during the time the fields are open and left for collection are left at the hirer/providers risk. The Festival accepts no responsibility for any caravan within the campervan fields which remains with the owner or hirer at all times. Can my car be kept beside the caravan in the campervan/caravan field? Yes, there is space for one car to be parked beside or in front of the caravan. However, any other member of your party arriving separately by car will need to purchase a car parking ticket. There is space for one towing vehicle to be parked beside or in front of the caravan. However, any other member of your party arriving separately by car will need to purchase a car parking ticket for the public car parks. For more information please click here. Can I pitch a tent beside my caravan/campervan? The Fire Officer will not allow ticket-holders to camp beside campervans or cars due to the risk of contiguous fire, but it is permitted to camp behind them subject to there being space available within your allocated pitch size after the caravan/car and or campervan are parked. Yes, as long as it is a purpose-built, manufacturer-made trailer tent. Yes. However, for all vehicles longer than 8 metres it will be necessary to purchase a large caravan/campervan ticket (£200), to cover the extra space required. Please note large pitches are only available at the Bath and West Showground. Will I be able to put up an awning? Can I sleep under the awning? Yes, manufacturers’ awnings are acceptable if they fit within the pitch size of 8m x 7m and can be slept in if they are a manufacturers’ annex or inner tent, but please make parking steward aware if you are sleeping in the awning..
Stewards will be on hand in the campervan fields to advise on siting vehicles. It is not possible to reserve a specific area – space is allocated on a first come first served basis. Caravans, their towing cars and campervans will be parked in rows, with a 4 metre fire road between the rows. Each pitch will be 7 metres wide by 8 metres long. For vehicles longer than 8 metres it will be necessary to purchase a large caravan/campervan ticket (£200 only available at the Bath and West), to cover the extra space required. .
No. Absolutely no generators are to be brought on site. Can I bring glass bottles with me in my campervan/caravan? Glass is not permitted anywhere on festival land. The usual Festival confiscations policy applies to campervans and caravans. The security staff will also check for any other items not permitted on site, as specified in the terms and conditions on weekend tickets. Security staff will confiscate any such items and may refuse entry to the site. Domestic items that will stay within the campervan are unlikely to be confiscated, however we would advise not to bring anything valuable just in case. The decision of the security team will be final. Please ensure your caravan and campervan field ticket is displayed in the centre of your windscreen at least 10 miles away from the site. • Each Caravan or Campervan must have a Campervan ticket and each person within the vehicle must have a valid Weekend Festival ticket. • Vehicles are parked within an approximate 7m wide x 8m deep pitch, with a 4m fire lane between rows, as directed by Parking Stewards. • Only one Campervan/or Caravan with car may be parked in each approximate 7m x 8m pitch. • An additional small tent may be pitched in the space behind the Campervan/Caravan, as directed by parking stewards, if space is available, however space is very limited. • Vehicles over 8m long require an oversized/large pitch (16m x 7m) and must be sited at the Bath & West Showground (White route). • No vehicles are to be parked or tents pitched in the fire lanes at any time. • No trading of any kind is permitted from caravans or campervans. • No sound systems are to be operated in the caravan/campervan fields. Anyone found operating such systems may be liable to confiscation of the system. • Fireworks, generators, glass containers, potential weapons, portable laser equipment including laser pens or any illegal or offensive items or substances are not permitted in these fields and will be confiscated. No animals (except guide dogs) are permitted anywhere at the Festival. Vehicles in these fields are liable to search by security staff. • All waste-water must be put in the containers provided. It is illegal to pour waste-water onto the ground, into a sump or into a stream because of the danger to the environment. This will be monitored by the Environment Agency. • All litter must be cleared and put into litter bins or recycling bins. • Open fires are not permitted. Small barbecues can be used in these fields, but they must be at least 3m away from any vehicle. • Towing vehicles must remain with caravans, not parked elsewhere. • Self-driven vehicles must be clear by 6pm on Monday 1st July. Any remaining vehicles will be removed. Hire caravans and collections can take place on Tuesday but any unit or property left onsite is left at the owner’s risk. • On Sunday 30th June, at midday, the one-way system will be reversed to allow Festival-goers to leave the area. Entry to the caravan/campervan fields will not be permitted after midday. There will be no inbound access to the caravan parks until 21:00 on Monday evening. • Users of these fields must not inconvenience local residents by trying to use the village for access. This will not be permitted. Please stick to signposted campervan routing. • Please respect the Countryside Code at all times. • Security staff may evict those that do not adhere to the conditions above, and may also confiscate their festival weekend tickets and any contraband items. • The Festival and Premises License Holder accept no responsibility for any loss or damages to campervans or caravans (whether hired or privately owned). Any insurance or deposit claims arising from your campervan/caravan use at the Festival should be directed to your insurers or campervan/caravan hire company. • Campervan/caravan tickets are personalised to the named campervan/caravan ticket booker, and are strictly non-transferable. If the person who books the campervan ticket subsequently cancels their ticket booking (prior to 3rd May), the campervan ticket will also be cancelled. If someone else within the original booking would like to take over the campervan ticket, the booking can be rebooked with their registration as long as this is requested at the point of cancellation (£10 admin fee will apply) but the booking cannot be reassigned retrospectively or transferred to someone who wasn’t in the original booking. • Whilst every effort will be made to accommodate campervans in your preferred site, the Festival reserves the right to provide alternative facilities in the event of adverse conditions.